Standing Rock Sioux Chairman Voted Out Of Office : The Two-Way Standing Rock Sioux Chairman Dave Archambault lost a re-election bid after a controversial campaign to block the Dakota Access Pipeline. 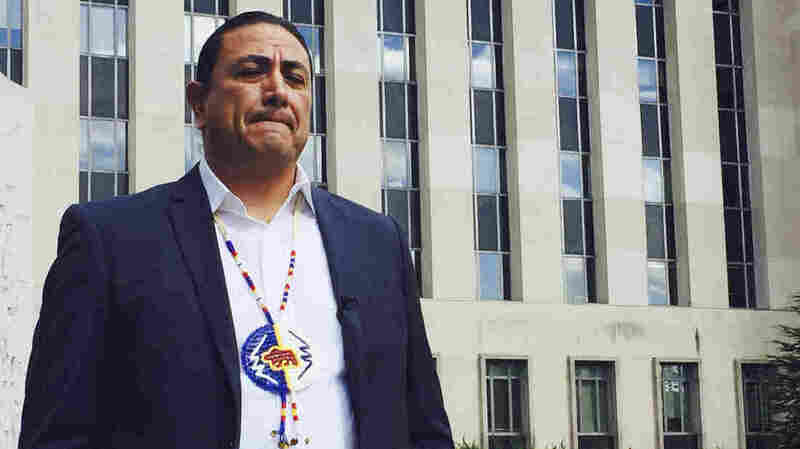 Dave Archambault, chairman of the Standing Rock Sioux Tribe, stands outside court in Washington in October 2016, where appeals court judges heard his tribe's challenge to the Dakota Access Pipeline. Under Archambault's leadership the tribe opposed the 1,000-mile, $3.8 billion pipeline. It transports up to 520,000 barrels of crude a day from North Dakota to Illinois. A section of the pipeline is located just north of the tribe's reservation, and opponents argued construction would compromise sacred lands. They also worried that part of the pipeline under the Missouri River could leak and pollute local drinking water. The tribe's opposition inspired protest camps that attracted demonstrators from around the world. There were clashes with police and hundreds of people were arrested. "[Faith] said he personally opposes the pipeline but thinks the large-scale protest took focus away from other issues, including health care, education, elderly needs, suicide problems, illegal drugs and a poor economy. Still, the pipeline is an ongoing issue. The tribe continues to battle the pipeline company, Energy Transfer Partners, in court even though oil began flowing through the pipeline this summer.